You’ve probably heard about using the actual banana itself to boost beauty, mainly in facemasks since it nourishes skin and is a natural moisturizer. But in the interest of using the whole part of the fruit, banana peels have been used in a host of beauty hacks. Below are several banana peel beauty hacks that will make you never look at bananas the same way again. Just remember: these should always be used with fresh banana peels while the banana is ripe. 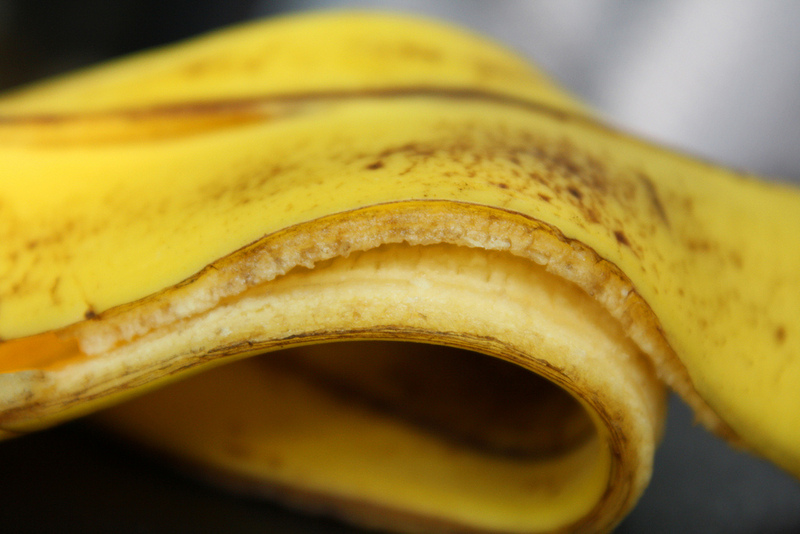 This is one of the most popular banana peel beauty hacks. Banana peels can be used as a natural acne treatment. Simply rub the blemish with the inside of the peel three times a day for a few minutes. The antioxidants should help reduce the swelling and redness of the breakout. Just make sure to rub gently. Another trick is to massage the skin with banana peels for a few minutes each day for a more preventative measure against acne. It can help exfoliate, moisturize and douse the skin in antioxidants for healthy skin overall. Try this for a month and see if it helps, as different skin types may react differently. It might also brighten your complexion, as well, since bananas are used for that purpose. One of the main beauty properties of banana peels is that they can be used to lighten just about anything, including teeth. The potassium, magnesium, and manganese in ripe peels may help lighten teeth. If you want to give this a try, simply rub the inside part of the banana peel right over your teeth for a couple minutes, and then rinse. Do this a couple time per day until you see the desired results. An old home remedy for getting rid of splinters is to use the humble banana peel. You simply tape the banana peel with the slick side down over the splinter and leave it for a half hour. Then remove the peel. Your splinter should have moved closer to the surface of the skin, as prompted by the enzymes in the banana peel. That means easier removal with less likelihood of a red mark being left behind. If you don’t have cucumbers on hand, you can use the inside of a banana peel to get rid of puffy under eyes in the same way. Leave them on the puffy part of your eyes for five to 10 minutes, or longer for very dark marks. Then rinse the area with cold water for a more alert look. The lightening effects of banana peels can also be beneficial for scars. Rub the inside of the peel on the scar(s) until the peel turns brown. Do this a few times per day until you see the desired lightening effect.